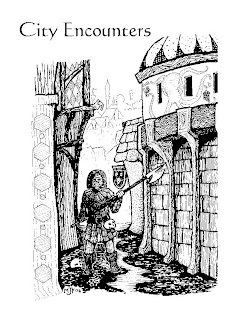 City Encounters, written by Matt Finch, is 42-page PDF, and the second release from Mythmere Games to support its OD&D retro-clone, Swords & Wizardry. For $2.95 you get nearly twenty pages worth of random city encounters that are, in the author's words, "strongly slanted toward a swords & sorcery feel, and ... designed to provide adventure possibilities rather than accurate demographics or historical reality." From the attractive black and white cover illustration (also by Finch) to the tables themselves, I was regularly reminded of the best Judges Guild products from days of yore. That is, City Encounters is a product that exists solely to be used in play. It's not intended to be read for its own sake -- though the entries on the encounter tables are often amusing -- but instead used in conjunction with some dice (a D6 and D% to generate numbers from 100 to 699) to help the beleaguered referee determine whom the player characters encounter while traveling through the latest wretched hive of scum and villainy they call home base. Drug dealer Shahaan the Shadow (5HD), selling opium paste (1,000gp in inventory), watched by crows controlled by his guild, the mysterious Dream Guild. (25% chance to ask characters to help him rob an incoming cargo of lotus blossoms – owned by the thieves’ guild). As you can see, Finch packs a lot of flavor into very few words and simply reading the above entry gives me several ideas for adventures either dealing directly with Shahaan or by spinning off elements of his description into something more elaborate. Not all of the entries are necessarily as evocative as this, but all of them give the referee exactly what he needs to form the kernel of an interesting encounter in a swords-and-sorcery city. Having had to populate large random tables myself, I'm frankly amazed that City Encounters includes so many intriguing and downright useful entries; it's a tribute to Matt Finch's fertile imagination and it's hard not to be inspired by it. Equally useful is the second part of City Encounters: a collection of tables for the random generation of non-player characters. Beginning with tables describing a NPC's personality and attitude, the product then goes on to include others describing spellcasters (clerics and magic users) for a variety of levels. These spellcaster tables are particularly useful because, through a simple dice roll, they give the referee a complete spell list appropriate for the NPC's level, as well as the likelihood of their possessing magical items of various types. I've seen random NPC generation tables before, but few have been as user friendly as these, providing a lot of variety without much complexity. They're the kinds of tables a referee could easily use on the fly at the gaming table, which I think is as much a testment to Swords & Wizardry's old school simplicity as it is to Finch's ingenuity. The product ends with random tables for generating male and female swords-and-sorcery names (including titles and nicknames, such as "the Heretic" and "the Man-Killer"). City Encounters is a terrific little product, filled with great ideas. It's a perfect exemplar of old school sensibilities, but, because of its rules light approach (itself an old school virtue), it could easily be used with new school RPGs without much trouble at all. Considering its price, it's an absolute steal. My only real qualms about it are small. First, as I noted earlier, the night encounters table feels almost vestigial, given its brevity. I hold out hope that one day, either in an expansion of this product or another similar product, we might get a night encounter table that's as varied and imaginative as the daytime encounter table. Second, the daytime encounters, while superb, are almost uniformly with individuals rather than with events. It's a small criticism, to be sure, but I do like to break up my NPC encounters with random happenings, such as a horse-drawn wagon losing a wheel or a chamberpot being dropped on someone's head. Events are every bit as useful as meeting people in the streets in my opinion. Finally, City Encounters feels a bit disjointed and, well, random in places. Though its contents are very good and useful, they lack a certain amount of cohesion, much like the Judges Guild products of old. This too isn't really a criticism and I expect that many old school fans will see this as a selling point rather than a distraction. Like Eldritch Weirdness, Book One before it, City Encounters is a terrific book. I found it useful, imaginative, and inspiring. It's exactly the kind of gaming product that I think nicely serves to illustrate what makes old school gaming so compelling, even after all these years. I hope that other old school publishers will be similarly inspired by it and create products in the same vein. If they're even half as good as Mythmere's releases have been to date, I'll be one happy gamer. ... of course, the PCs in my game are nowhere near a city. Figures. Lovely to see two supplements for Swords & Wizardry. One problem: where is Swords & Wizardry itself? I think most of the grognardverse is waiting eagerly to see that final version finally go up.